1 in 10 consumers owns between one and 10 promotional products. Once every week, 53% of these people use a promotional product. Six in 10 of them keep these promotional products for up to two years. Only one in five people will throw away an unwanted promotional product. Prior to receiving a promotional product, 55 percent of people had done business with the advertiser. After receiving a promotional product, 85 percent of these recipients did business with the advertiser. Thirty-one percent of consumers in the United States own a promotional bag. At one-tenth of a cent, bags tie with writing instruments for the lowest cost per impression of any promotional product in the United States. The first known promotional products are commemorative buttons – traced back to 1789 when George Washington was elected president. Fifty-three percent of the time, promotional products create an impression of the advertiser that is more favorable. Promotional Products are a desired form of advertising: Forty-eight percent of consumers would like to receive promotional products more often. Consumers hang on to promotional products for an average of 6.6 months – certainly longer than any coupon, newspaper ad, or commercial. Sixty-nine percent of consumers would pick up a promotional product if they deemed it useful – key word here is”Useful”. Sixty-three percent of consumers pass along the promotional products they no longer wish to keep, therefore sharing your brand or message. Eighty-nine percent of consumers can recall the advertiser of a promotional product they’d received in the last two years – now that is longevity. Ninety-one percent of consumers have at least one promotional product in their kitchen, 74 percent have at least one in their workspace, 55 percent have at least one in their bedroom – They are everywhere you want to be. The first promotional product tradeshow was held in 1914 – there were 32 exhibitors – over 200 years…not likely to go away soon, either. Logoed mugs in particular are more effective advertising than radio and television spots; 57 percent of people were able to recall the advertiser on a mug, versus 32 percent of radio and 28 percent of T.V. – recall, recall, recall. Adding a promotional product to the media mix increases the effectiveness of other media by up to 44 percent – great addition to your existing campaign. 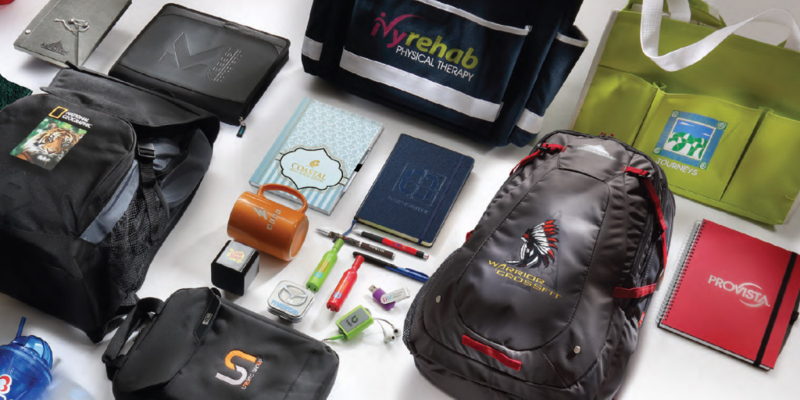 Promotional products draw as many as 500 percent more referrals from satisfied customers than an appeal letter alone – a thank you gift can go a long way. Put your advertising/marketing message or brand in the hands of your customers, followers, and prospects and they will take your message to the masses. Now that is effective! Have you been skeptical about the power of promotional products (or) do you know someone who is? Share this blog with them and help them see the “light”.